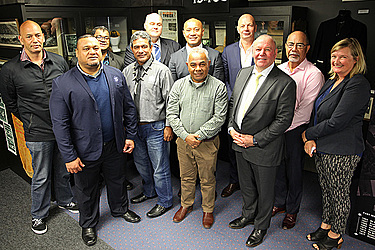 The Chairman of Rugby League Samoa, Tagaloa Faafouina Su’a joined leaders of Rugby League in the Pacific in Auckland yesterday to agree the future direction of the international game in the region. Chairmen and Chief Executives from Tonga, Fiji, PNG, Samoa, the Cook Islands, New Zealand together with senior NRL staff discussed a potential 2019/2020 calendar, incorporating what has previously been known as the Pacific Test. This calendar would see all Pacific countries play each other regularly in meaningful match ups. Following the meeting, the International Federation have been asked to undertake further feasibility work ahead of a formal decision later this year. Tribute was paid to the NRL for their work in establishing the Pacific Tests and their vital role in the recent success of Pacific Island nations, which has brought the international to this exciting crossroads. Tagaloa, Chairman of the Asia Pacific Rugby League Confederation said it is time for nations to take a more pro-active role in the development of the international game. “We are now in position for the Pacific nations to take an active role in creating our own future,” he said. Frank Puletua, N.R.L. Senior Manager International Strategy and N.R.L. Awards said: “I am excited for the international game and we are at a pivotal point in the history of the game – especially in our region - to build on the momentum of the Pacific Tests and last years Rugby League World Cup.